Western Kyoto has long been known for its natural beauty. In fact, the Arashiyama district has been a favorite of tourists for well over 1,000 years. The beauty of this region peaks twice a year, first during the cherry blossom season, and later during the time of autumn color. 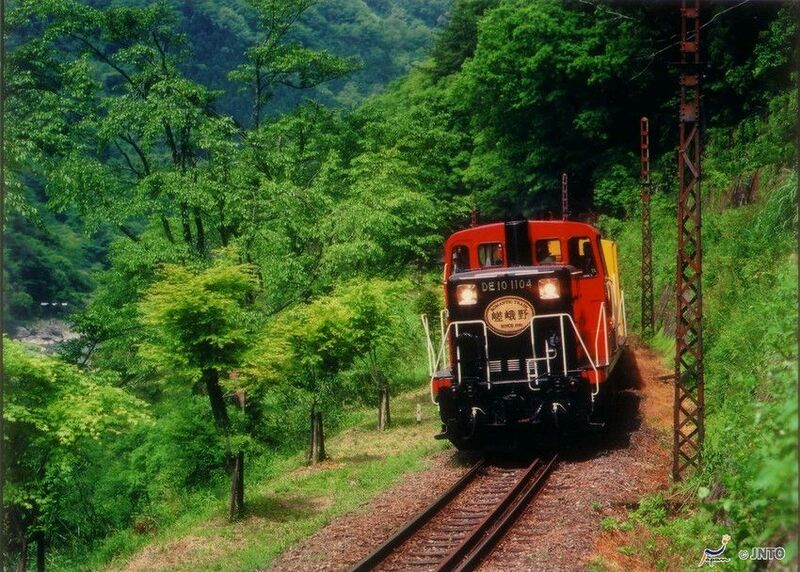 The Sagano Scenic Railway is a wonderful way to tour and enjoy the natural beauty of this rural region. 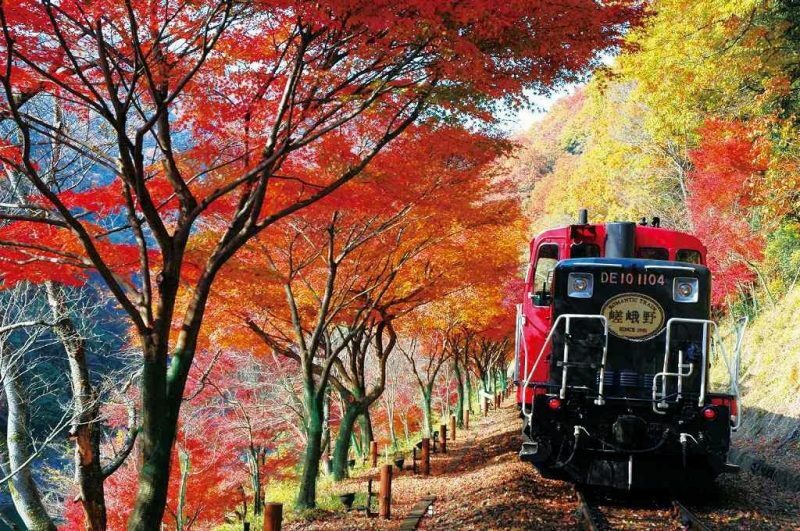 The train has come to be known as the Sagano Torokko, or Romantic Train, because its passage takes guests sightseeing through such romantic scenery. If you’ve seen enough of the city, one of these day trips from Kyoto will bring a smile to your face. The journey starts from the red-brick building Saga Torokko Station, which is located right next to the JR Saga-Arashiyama Station. Simply use your Japan Rail Pass to travel to Arashiyama. The Saga-Arashiyama Station is a brief 15-minute train ride from the Kyoto Station. The Sagano Scenic Railway runs near the Hozugawa River. 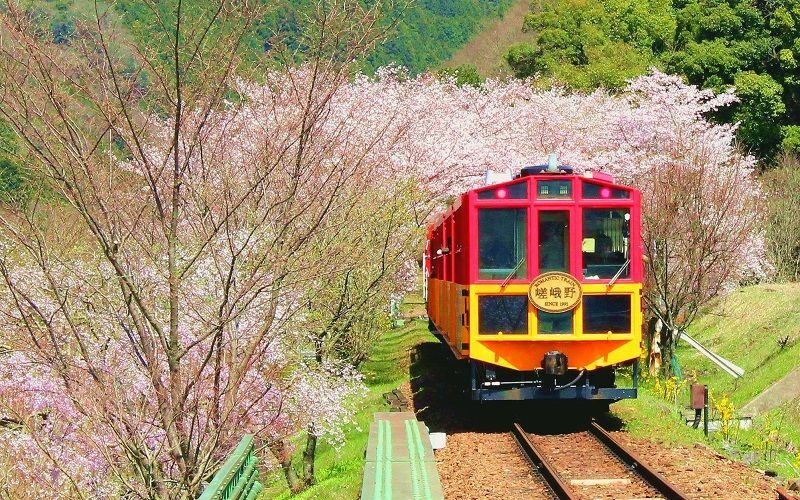 During the months of March and April, boughs of pink cherry blossoms sway above the passing train. In November and December, the trail is lined with flaming orange and red autumn leaves. The railway traverses seven kilometers, and the trip takes about 25 minutes one way as the train winds slowly through the mountains. The train itself is of a nostalgic style, complete with wooden bench seats. It features one fully open car and four enclosed cars with the option of opening your personal window. After making a single trip on the Sagano Scenic Railway, you can choose from a number of exciting options for your return trip. Take a short bus ride from Kameoka Torokko, the terminal train station to the docks of the Hozugawa River. Then, you can take the Hozugawa River cruise on your way back to Kyoto. A single ticket for the cruise costs ¥4100. Your final stop will be again Arashiyama, just outside of Kyoto. Cruise departure times are scheduled according to the Scenic Train timetable. While the Sagano Scenic Railway is not covered by your Japan Rail Pass, the trip is worth the small extra cost. You may purchase tickets at the Saga-Arashiyama Station or at any Japan Rail ticket office in the Kansai region. An adult one-way ticket between the Torokko Kameoka and Torokko Saga Stations costs ¥620, and a children’s ticket costs ¥300. Return tickets cost the same. Most tickets are sold for reserved seating; however, standing room only tickets may be sold during especially busy times. If you are traveling during the spring or autumn and wish to be ensured a seat, purchase your tickets in advance of your trip. The trains of the Sagano Scenic Railway operates from March 1 to December 29 each year. Guests can enjoy the Sagano line Thursday through Tuesday of each week. Please not that he trains do not run during the winter season, nor on Wednesdays during the spring, summer, and fall. The trains depart once per hour from 9 a.m. to 5 p.m.
To make your day trip complete, consider visiting nearby tourist attractions, either before or after your scenic train ride. Upon arrival at the Torokko Saga Station, travelers may tour a small train museum. Before departing or upon your return, there are a number of interesting adventures awaiting you in Arashiyama as well. 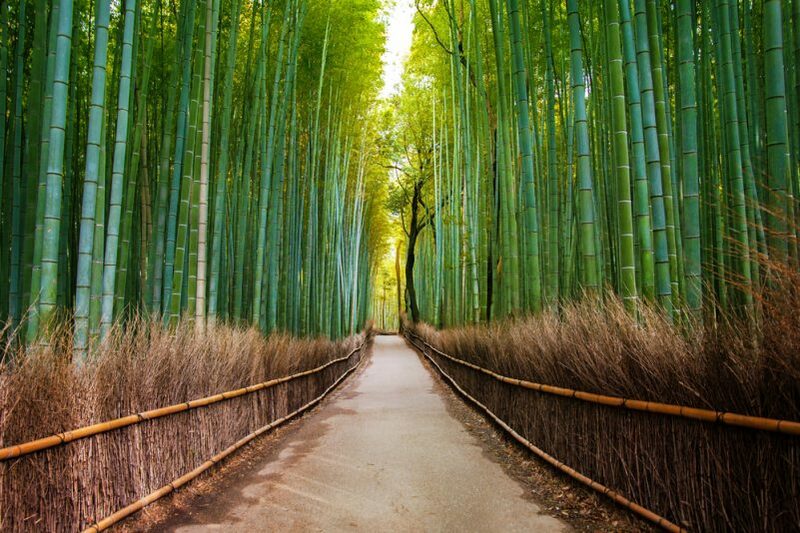 A visit to the area is not complete until you have experienced the Arashiyama Bamboo Grove, a walking tour amid tunnels of towering bamboo plants. View majestic rolling hills from the Togetsukyo Bridge, the “Moon Crossing” Bridge, in Arashiyama’s city center. The animal lover in your traveling party will enjoy the Iwatayama Monkey Park in the Arashiyama Mountains, just a 10-munite hike from the bridge. There, visitors can view over one hundred monkeys roaming free within their habitat. Or, you can visit the Otagi Nenbutsuji Temple. This modern Buddhist temple captures the aura of much older sites. It is famous for its 1,200 stone statutes of different Buddhist devotees, called rakan. Each of these sites – the bamboo grove, bridge, park, and temple – will add flavor to your trip as you experience an authentic taste of traditional Japan. Is sagano scenic train wheelchair accessible? Hi Soon Kup Lee! Sagano Romantic Train’s staff ask that visitors using wheelchairs please request for assistance as needed. Ramps are installed within Saga and Kameoka Torokko Stations, but a staff member will use a portable ramp to help customers on wheelchairs onto the train. There are also elevators at Kameoka torokko station. It is the very lovely colored atmosphere. The route of the train is so much romantic. May i know if i at tokyo where can i buy the ticket for Sagano Romantic Train ticket in advance? Hi, I have bought the JR Kansai Hiroshima pass. Can I use this pass for the sagono romantic train ride? Just to make sure, Is the Sagano scenic railway is included in Japan Rail Pass as you mentioned above? As specified in this article you are commenting, the Sagano Scenic Railway is not covered by your Japan Rail Pass. However, the trip is worth the small extra cost! I’d like to visit sagano on late october between 23-24 oct, what colours could the autumn leaves? Has it red already? According to last year’s Fall Foliage Forecast, the estimated best viewing in Kyoto area was between mid November to early December. Please note the forecast will not be the same every year so we recommend you to check the 2018 one when the dates come closer. I am using Kansai Area Pass https://www.westjr.co.jp/global/en/ticket/pass/kansai/ , is this train include in our Pass ? Sorry but the Sagano Scenic Railway is not included in the Kansai Area Pass. It is included in the Japan Rail Pass, so we hope you can use it or recommend it in the future! Hozugawa River cruise is not 310 Yen, it is 4100 yen single trip!! Thank you for pointing that out, Santa! You are completely right, we have just amended the mistaken cost. is it possible to buy the Sagano Scenic Railway Ticket and the cruise ticket online? As stated in this acticle you are reading, you may purchase tickets at the Saga-Arashiyama Station or at any Japan Rail ticket office in the Kansai region. Also since you are travelling to Japan we recommend you to do so with wifi connection from your own since public one is not reliable. We think best options would be to rent either a Pocket WiFi device or a SIM Card for the duration of your stay. Hi. I will arrived in Osaka on 7 Dec and would like to purchase Sagano Romantic Train Ticket. I’m search online and there no way to buy online for the ticket. Can you advise where can I buy the ticket from Kansai International airport? As stated in this article, you may purchase tickets for the Sagano Scenic Railway at the Saga-Arashiyama Station or at any Japan Rail ticket office in the Kansai region. If I take a single way to the Kamoeka Station, how much time should I spend there before return ride back to the Saga Station? It will depend on what you want to do. Once you get to Torokko Kameoka station you might take the train back to Arashiyama go to Umahori station and take a JR train to Arashiyama or Kyoto ot even take a boat trip through Hozugawa river that will take you back to Arashiyama. The most economical pass will always depend on your itinerary and that is why we always recommend you to check which is the cost of the individual trips at Hyperdia and compare it to the price of the nation-wide pass. Keep in mind the Japan Rail Pass would not only cover your trips between Osaka and Kyoto but also the airport transfers and some transportation within Osaka city. I would like to take Sagano train from Kameoka torrokko station , it there any ticket counter at Kameoka Torrokko station ? Or can i change my reserved ticket (bought at Jr West office) to Car 5 ticket at Kemeoka Torrokko station ? “The Rich” (car No. 5) tickets are only available as a same-day ticket. However you can purchase a standard ticket in advance (as it looks like you have already done) and visit Torokko Station’s ticket office on the same day you are travelling to exchange it for a car 5 ticket. Please note that possibility of change is subject to seat availability. Hi! I will be arriving in Kyoto on Nov. 13 and plan to go to Arashimaya on the 14th.. I’m worried that I won’t be able to get tickets for the Sagano train and was wondering how I could buy the tickets in advance? thanks! Tickets can be bought in advance from Midori-no-Madoguchi counters at major JR West stations, or at major domestic travel agencies, beginning at 10 a.m. on the day 1 month prior to your ride date. You can also purchase tickets at Central Japan Travel Center, Chubu Centrair International Airport; Kansai Tourist Information Center, Daimaru Shinsaibashi; Kansai Tourist Information Center, Kyoto. You may also check the seat availability here. I will be arriving in Japan on Nov.12 and its in the evening and I’m worried the tickets might be sold out for Nov. 14. Is there a website where I can purchase the tickets outside of Japan? thanks! You have to purchase the tickets once you arrive to Japan in one of the locations we specified in our previos response. You may check the advanced seat availability here. 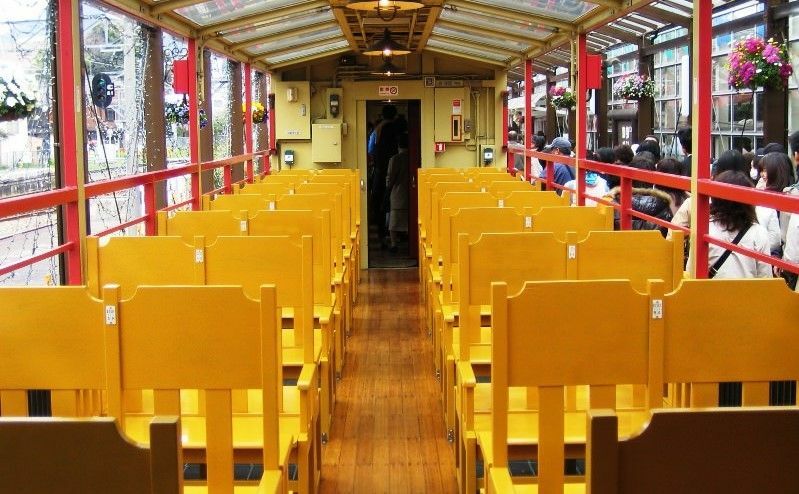 All the details can be found at Sagano Romantic Train Official website. Hope you have an amazing time in Japan! Dear Sirs once I have bought the JRP how can I get help to find what will be teh best trains for me to book? can I do it from italy before activating the pass? Hope you are well. First you need to decide your travel itinerary for Japan. We know it can be difficult to do so! For that reason we suggest you to have a look at our itineraries in Japan. If we were to go on tour to Osaka, Kyoto, and Tokyo for 10 days, the 7 day JR PASS wont be enough… so we should combine this with another kind of train pass?? If you want to use the Japan Rail Pass during your whole trip you might want to purchase a longer duration one. However we recommend you to prepare your trip to assess if you will be using it during all days and to see which is the option that better pays off. To help you with costs and itineraries we recommend you to check Hyperdia, the number 1 Japanese online transportation planning tool in Japan, which will enable you to precisely plan your trip from station to station with punctuality to the second. Hi. I’m arriving at Tokyo on March 24. I plan to take the Sagano Scenic Railway on March 25. How do I go to Sagano Scenic Railway from Tokyo Station using my JR Pass? Can I purchase in advance a ticket for the Sagano Scenic Railway at Tokyo Station? The Sagano Scenic tickets can be purchased at any JR ticket sales office in the Kansai Region or at the Torokko Saga Station. Make sure to purchase your tickets early, especially during the peak seasons, which begins the last week of March. The terminal Sagano Scenic Railway station – Torokko Saga is located just 10 minutes walking distance from Arashiyama Station. You can reach Arashimaya Station, using your JR Pass, via the JR San-In Line from the central Kyoto Station. To select the most convenient time for you to travel from Tokyo to Kyoto with your Japan Rail Pass, take a look at our Hyperdia page. I’m visiting Arashiyama on 31 March 2017.we would like to make reservation for the Sagano Romantic train.any idea how can I make reservation in Singapore now before leaving to kyoto. Thank you. Your travel plans sound great! Unfortunately, you will not be able to book a seat on any Japanese train while outside of Japan. Please take a look at our Complete guide on riding the Japanese trains for more information on seat reservations. Thanks for the info at the JR pass. We are visiting Japan from 17 Sept – 23 Sept 2017, arriving Haneda at 5.15am. Can you tell me if the 7 day combined JR pass and hotel stay at Kyoto can include a 2 -3 day stay in Hiroshima. If so can we obtain discounted hotel stay in Hiroshima? Our plan is to travel to Kyoto on 17 Sept, stay 3 nights, then travel to Hiroshima for 2 nights and then return to Haneda. We are leaving for Europe on 23 Sept at 5.40pm. The Japan Rail Pass includes limitless trips through the whole country, it is nationwide and not tight to a certain area of the country. So yes – you can use it to get to Kyoto, Hiroshima and back to Haneda. Holders of the Japan Rail Pass can also take advantage of discounted prices with the JR Hotel Group. If you present your Japan Rail Pass at the reception upon arrival, you may also enjoy some special services (depending on the hotel). 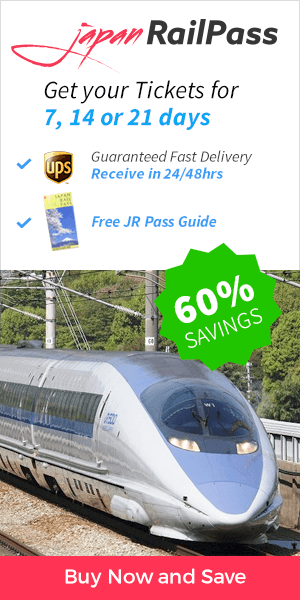 You can easily purchase the Japan Rail Pass and have it delivered to your home or work address. Upon completing your purchase, you will receive a confirmation email with a direct link to live shipment tracking.